Your website is your most valuable player. That’s right. Your website works 24/7 to bring you sales, leads, readers, and customers. It doesn’t take holidays. It doesn’t take long lunch breaks. It works relentlessly to impress your audience and bring in sales so that you can focus on what’s important to you. But Is Your Website Working to the Best of Its Abilities? If you want a quick way to drastically increase your business, then you should focus on making your MVP the most efficient and effective player out there. 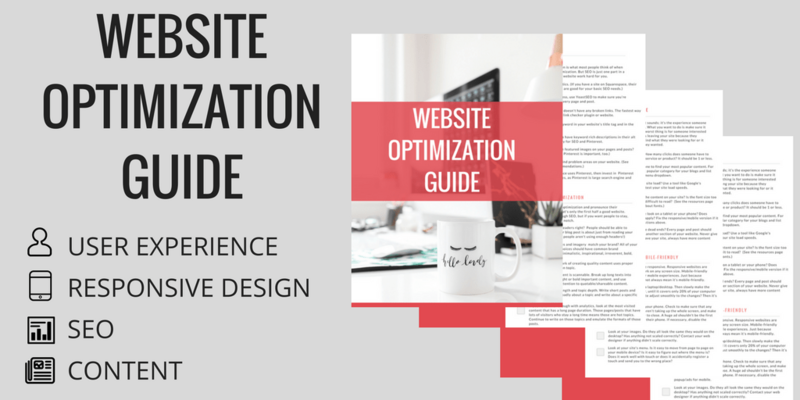 You need to optimize your website. Now, the term “optimize” can mean everything to everyone. Most of the time, when people hear the word optimize, they usually think of SEO. But if you only focus on SEO, you’d be missing out on improving so many other aspects of your site. What Do You Need to Optimize? I’ll go into brief detail about each other these below. But in the meantime, be sure to grab your optimization checklist and resource guide right now. User Experience (UX) is just like it sounds; it’s the experience someone has when using your website. What you want to do is make sure it was a great experience. The worst thing is for someone interested in your products and services leaving your site because they couldn’t understand how to find what they were looking for or it took too long to load what they wanted. Go to your homepage. How many clicks does someone have to make to see your main service or product? It should be 1 or less. How quickly does your site load? Use a tool like Google’s PageSpeed Insights to test your site load speeds. Does your website have dead ends? Every page and post should have a call to action to another section of your website. Never give anyone an excuse to leave your site, always have more content ready! Most websites these days are responsive. Responsive websites are sites that are designed to work on any screen size. Mobile-friendly means that it is optimized for mobile experiences. And FYI, just because your site is responsive does not always mean it’s mobile-friendly. The reason this is important is because, if you’re like the rest of the web, more than half of your web traffic first views your site on a mobile device. Dang. So if your site looks bad—or heaven forbid, is broken—when viewing from a mobile device, you just lost HALF of your potential customers right out of the gate. You can download the guide to find out just how mobile-friendly and responsive your site really is. Open your website on a laptop/desktop. Then slowly make the browser screen smaller, until it covers only 20% of your computer screen. Did your website adjust smoothly to the changes? Then it’s responsive. Look at your images. Do they all look the same they would on the desktop? Has anything not scaled correctly? Contact your web designer if anything didn’t scale correctly. Look at your site’s menu. Is it easy to move from page to page on your mobile device? Is it easy to figure out where the menu is? Does it work well with touch or does it accidentally register a touch and send you to the wrong place? Search Engine Optimization is what most people think of when they think of website optimization. But SEO is just one part in a larger role of making your website work hard for you. Do all of your images have keyword rich descriptions in their alt tag? This is necessary for SEO and Pinterest. Check that your site doesn’t have any broken links. The fastest way to do this is to use a link checker plugin or website. Many people stop at SEO optimization and pronounce their website good to go. But that’s only the first half a good website. You got people there through SEO, but if you want people to stay, your content has to be top notch. Make sure your content is scannable. Break up long texts into bullet points, highlight or bold important content, and use whitespace to call attention to quotable/shareable content. If you’re familiar enough with analytics, look at the most visited content that has a long page duration. Those pages/posts that have lots of visitors who stay a long time means those are hot topics. Continue to write on those topics and emulate the formats of those posts. Downloaded the checklist and got everything checked off but looking for more? Below are some next steps you can take to up your game on website optimization. Enroll in the free Google Analytics Academy to become a master of SEO, link building, and marketing. Research tools like BoardBooster to up your Pinterest optimization and increase traffic to your site. Create a content strategy based off of your analytics results. If you use ads or pop-ups, create ads/opt-ins that are just for mobile device views that doesn’t interfere with their experience of your website. That’s it for now. So hurry up and download the checklist to get the rest of the checks and to get the resources sections!